These chilly rainy/snowy days are perfect for soup making. We have had just about every kind of weather today from winds, to snow, to rain, to some form of precipitation that is somewhere between rain and snow and accompanied by wind. It’s time for the comfort of chicken soup with dumplings. I don’t always have the time or inclination to spend time on preparation. This recipe was one I concocted to be able to serve something within an hour after arriving home from work but it’s so tasty that I find I return to it even when I have leisure. I don’t believe there is anything more satisfying than a chicken and vegetable soup unless it is one with dumplings. I can easily prepare this soup for items I always have on hand and it is always well received. I have a number of chicken soup recipes that are standards and this one is one of the best. It is a perfect warm up soup on those days when you just can’t fight off the chill. It is also good if you are feeling under the weather. Of course you don’t have to find an excuse to eat it. I like it during any time of the year. Put chicken, broth, chopped carrots, celery, tomatoes, onion, herbs, seasonings, and garlic in a pot. Cover it and cook for 30 minutes until the meat is starting to fall off the bones. Stir together the Bisquick and milk in a small bowl until it’s sticky and no too loose. Drop large spoonfuls of the Bisquick mixture into the boiling soup. Cook for 10 minutes uncovered. Cover the pot and cook for another ten minutes. 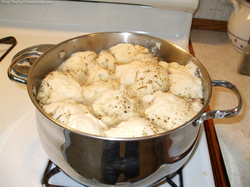 This entry was posted in Recipes and tagged chicken, chicken soup, Coastal Maine, deer isle, Downeast Maine, dumplings, easy recipe, recipe, Shawn Phillips. Bookmark the permalink.